This is a post of a different type. My story takes place in the 1860's - my story family and their dog have traveled from the Philadelphia, area to a farmstead in southwest lower Michigan. September 03, 2012 ~ LABOR DAY evening. Become a follower, leave a comment with the name you think I should use and I'll enter your name TWICE in the drawing for Monday ~ September 03, 2012 ~ LABOR DAY evening. Winners receive one of two Historical Romance Novel - of my choosing. Two opportunities to win. I will be choosing from TWO names that get drawn. Can't wait to see what you come up with ~ and who wins! I'd name him 'Tip'... but I just watched the BBC version of Little Dorrit, by Charles Dickens, so it's not hard to figure out where that came from. Thanks for the "tip" - will put TIP and you in the LABOR DAY DRAWING - thanks for the 'tip'. I named a similar dog in one of my WIPs, Rustler. Hope you don't mind me adding "RUSTLER" to the drawing along with your name, David. Hi Joy! I just became a follower and I like the name "Mister Bark Lee" but he would go by "Barklee". My aunt had a Border Collie that looked just like the one in your picture and that was his name. So glad you've joined my readership! What a beautiful dog! Can you name him "Skip"? And can I win him - after you're done with the story of course! Now, that's a thought, Cathy. He's not mine to give away - we had one like him when I was a kid - won't tell the name until this contest is over - but he looked just like this beauty. He was a really neat guy! I'd name the dog Jackson because Andrew Jackson was a famous president not too many years before 1860. Hi and welcome to my readership, Connie. NOW - that's a thought. Will put you and Jackson into the drawing - be sure to keep stopping by. Praying for you as you write. Another name I'd not thought of or remembered. Stop by anytime I DO like your ideas. You're in the drawing with Bandit! I say Bell, after Alexander Grahm Bell who was famous at the time. I may HAVE to enter you guys twice - with that many names to throw in the hat. Thanks for stopping by, ALL YOU WOODS' - appreciate the support! Have fun with the book & the dog! Thanks, Hol - you and Orion are in the drawing for a free historical romance book. Sure glad you came by today! My husband provided this name (and he didn't read any of the others). He says Skipper. Hubby says he looks like a skipper. Oh, I forgot ~ Can we win the dog? Nope - can't win the dog - he's/she's not mine to give away - seems you and others would like me to hold a drawing for him/her. Thanks for submitting a name - and leaving your comment. Will put it with the rest, Bonnie. Tell you dh I've added it to the hat. That's one smart breed you have there! So he deserves a stellar name like "Ferguson". Which comes from Philadelphia's Old Directory in 1890. I know that's later than your story but the name would have been older than the listing. Now that's some great research you've done there, Laura. I appreciate the entry and you and Ferguson's names will go into the hat for free book. We'll see which two names come out of that hat on Labor Day. John, because he was God's favorite apostle. That's a neat entry - different. I'd name him Trotter because that's what herding dogs do, and they can trot all day. Oh, I just HAD to join this discussion. 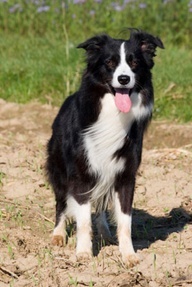 It's an English name and means enthusiasm and ardent which are things that scream Border collie. I've read many of your posts, but just now joined (dogs get me every time). I'd name him/her "Wander," maby short for "Wanderlust." My experience with border collies is that they are always on the move, can't stand to stay in one place, gotta be going, going going. Some more names to put in the hat! Jan - Wanderlust (Wander) is now in the hat - TWICE - thank you for stopping by ladies. I looked up synonyms for 'hunter' and got this one. GUNNER. My husband's mom and dad raised border collies on their farm up in Rogers City, MI. The dogs LOVED herding the cows. Each one they had was named REX! All Matt's dad had to do was say, "Rex, go get the cows." and Rex would take off and go get the job done. Thank you for adding to the mix. I've added GUNNER to the hat. Just joined your follower list, Joy. I have a Border Collie mix and he's in constant motion, when he's not sleeping. His name is Rocky. It's an effective name and gets his attention immediately, even when he's trying to herd cats. Two hard syllables. I'm putting JUNIPER into the hat TWICE - thank you for signing up to follow my blog, Linda. I'm putting your name into the hat as well. Border collies even herd cats? TWO BOOKS UP FOR GRABS! LOL, Joy, you could be right. I didn't see my picture pop up as a "newbie" so I'm probably already there. You were one of my very first followers - I'm indebted to you! GUESS WHAT GETS NAMED IN MY BOOK NEXT WEEK? BIGGER _ BIGGER _ Will be more than one to name - possibly three - probably! BIGGER THAN A BREAD BOX FOR SURE! LINCOLN will go in the hat. Next week I'll be posting a contest for naming some other animal(s) in my historical romance novel. Good luck with the writing, Joy! I'd not thought of that one, myself. ULYSSES is now in the hat! Drawing is Monday evening- be watching for the announcement! Glad you came by - with names in tow. I'm having a ball - there are some very interesting names coming in. Can't wait to read your next one!